Trust Fast Limo Hire to be there on time, every time. Our dependable and reliable nightclub limo hire will ensure that you are picked up promptly at the time requested and safely taken to your destination, on a ride so smooth you’d feel like you are sitting indoors. Our limousine hire will ensure that you start your party from the minute you step foot in our limousine, to the time you are taken back to your doorstep. We will put a sleek into your mood, liven up your night and make it a day that you and your friends will live to remember for a very long time. 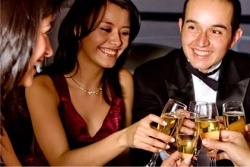 Whether you choose a party bus, a chrysler or the excursion, your night out will be highlighted extensively from the moment you choose our service, with the perks that our company provides – you will have a complimentary drink, an advanced surround system for your entertainment and a right laugh with your friends. Call our customer service team on 020 3006 2092 for more information on limousine hire for a night out in London.